Narcissister. 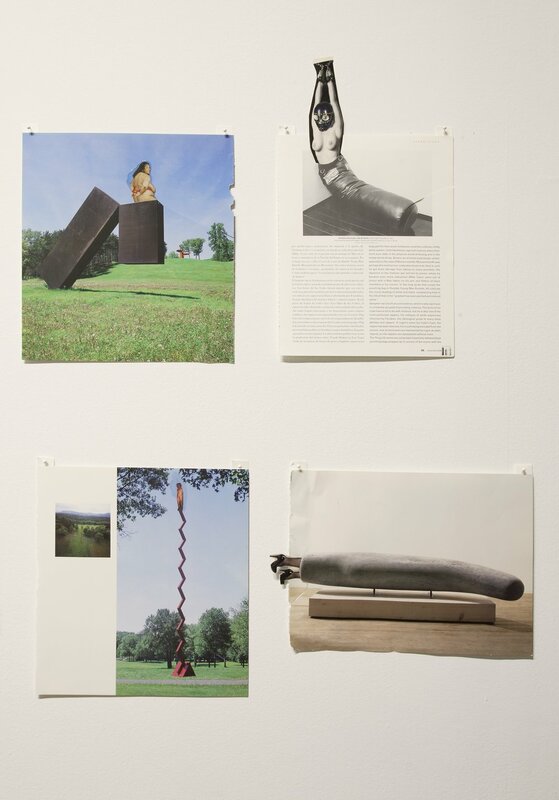 Installation view of "Studies for Participatory Sculptures" at Participant Inc. Photo by Mark Waldhauser. Only a few people know who Narcissister really is. Narcissister is only a pseudonym. It has been conceived of by one person but taken on by several collaborators. I have yet to discover her true identity, but I might provide here a few notes to understanding her. The core of Narcissister’s name, of course, is narcissism. We tend to think of feminist artists—of which Narcissister is a vanguard exemplar—as dealing only in altruism. In her performances and collages, Narcissister has certainly worked for the greater good by calling to mind prescient issues surrounding contemporary intersectional feminism and queerness. Her work presents the dream of a liberated body and the nightmares of its regulation, and, in this way, Narcissister has provided a far-reaching, collaborative, and expansive critique of the racism and sexism inherent to the capitalist patriarchy. What I find equally interesting, however, is that, despite her groundbreaking work in advancing a progressive identity politics, Narcissister’s root is narcissism – the self, the individual. Narcissism comes from the tale of Narcissus in Greek mythology, in which a beautiful boy falls in love with his reflection in a pool. So entranced is he by his own image that, immobilized, he dies staring into his own reflection. I wonder what it means for Narcissister to, in some way, valorize narcissism. The term has often been levied against women, who have been characterized for centuries as being shallow and easily lured by luxury and capitalistic desires. There is, however, a value to narcissism, in that it represents a right to one’s own self-image and one’s uniqueness. This interview’s preoccupation with death and loneliness seems pertinent. To consider your own demise is to imagine the world without you. How could the earth keep spinning in my absence? Should it keep spinning, or should it stop because I am no longer a part of it? I wonder if narcissism becomes a political tool, a methodology through which we can celebrate the value of all bodies. This is an especially revolutionary act if one’s body has been consistently erased because of racism, sexism, and homophobia. We deserve to derive pleasure from ourselves and to believe that humanity benefits from our presence. This, I believe, is who Narcissister is—an avatar of liberating self-ownership. WS: Who are your influences? N: It would be people like Leigh Bowery, Grace Jones and Jean-Paul Goude, Yoko Ono, VALIE EXPORT, Claude Cahun, William Pope L., Matthew Barney, Adrian Piper. I recently discovered an Italian artist named Leopoldo Fregoli who was a quick-change artist. Obviously, quick-change is a big part of my performance work. Those are the references that come to the top of my head. WS: This makes me think – Adrian Piper donated her body to the Museum of Modern Art when she dies. If you had to donate your body to an institution, would you do it and what would it be? N: It’s so funny because I was just thinking about this. I have been thinking about skeletons and how everything that defines us sits above our skeletons – our race, gender, age, our level of wellness or sickness. I want to connect with myself and with other people at the level of our skeletons. I’m just a skeleton moving through space and so are other people. Can we connect on that level? My parents have both passed away, and their wish was to be cremated. We put their ashes into the sea at a beach that we always went to when I was growing up, and I’m making a film that has to do with how my family life created my Narcissister character. In the film, you see Narcissister putting my mother’s ashes into that place on the beach. I always thought, when I pass away I would like to be cremated, but because of this thinking around skeletons I thought maybe I want my skeleton to be preserved. I wondered if my skeleton could be preserved in some museum context. I got very excited about that idea about six months ago, and I forgot about it until you mentioned it! I don’t know what the institution would be, but I do think it is very interesting for artists to work with their bodies. Why not take it to that place of collecting the physical body? I am surprised to hear that about Piper because she has a lot of exciting resistance to institutions in her work. It’s an interesting concept. If there’s anyone who could navigate the complexities of such a project, it would be her. The history of museums collecting human remains and artifacts is so problematic. Thanks for telling me about this! WS: Glad to be of help! The issue of the skeleton is interesting, because I was just in Chelsea and I saw a billboard with two X-rayed skeletons holding hands and it had something to do with LGBTQ rights. It was attempting to say that everyone is the same, but like you said everyone is not the same because there is flesh on top of that skeleton. N: Right, it’s so au courant – this argument of sameness among us. Or is it more powerful to assert the ways in which we are different or distinct? I think about this throughout my work as Narcissister because the mask presents a possibility of sameness or oneness in that it’s not me, it’s a neutral character. So anyone can portray her, and many other people have participated in the project. The mask has different skin tones, and it allows you to be flexible. Sometimes I’m a man. Sometimes I’m old, and sometimes I’m young. I can portray different races and ethnicities. Am I making some kind of statement or claim around oneness? Again, being very inspired by Piper, I think about putting myself in another person’s shoes in order to cultivate compassion or empathy by actively embodying another experience. I practice that in my work, but I don’t have the answer as to whether or not oneness is ultimately a powerful concept. WS: There’s been a lot of talk about oppression breeding creativity. Do you believe that? N: Creativity is a force that thrives in times of oppression and freedom. It’s just an unstoppable force. In this time we are going through politically, people are expressing all their fears, especially about what will happen to the arts, arts funding, and platforms for artists. I actually feel excited about how artists will work with any potential constraints that may come. I also think of other eras where there was political turmoil and the incredible work that emerged from those periods or just afterwards. I can see this being an exciting moment for artists’ outputs and insisting that their voices be heard. WS: Has our political climate connected to anything you’re working on now? N: Not that I’m directly aware of. Everything I’m experiencing obviously makes its way into my work. I imagine every artist feels this way. My work reflects the place and time in which I exist. So, it must connect, yes, but it is not apparent in any overt way at the moment. I’ve always been drawn to making political work that has an activist element. It’s always been imperative. WS: The interesting thing about inhabiting a persona is that I imagine it might be a lonely enterprise. What do you do when you get lonely? N: I’ve been thinking about that and wondering to what extent being an artist generally is a lonely enterprise. There are many artists who build collaboration into their projects, or they have studio assistants. I think it was Susan Sontag who wrote about why so many artists become addicted people, and the common conception that artists are tormented, and that’s why they become artists, or that’s what enables their creativity. Sontag said that artists actually become addicted because it’s one way to deal with all the hours of solitude and introspection that are essential to their practice – all the time alone reading or writing, or alone in one’s studio with one’s work. That made a lot of sense to me. It is an intense path, or it can be depending on the kind of work one makes. I have always been a solitary person, and that has not always been easy. I am aware of my quote unquote loneliness when I am sitting in my studio or traveling around the world by myself doing my performance work. I think that loneliness is inescapable, and, for me, a part of my path is feeling my loneliness and not trying to cover it up with something that might soften, if only temporarily, that feeling.